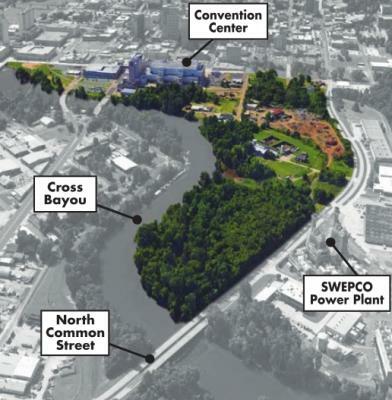 A new plan to develop the Cross Bayou area north of downtown Shreveport has emerged. The plan is the vision of Larry English and the Gateway Development Consortium. Long-range plans for the 63-acre development project include new facilities for parish and municipal government entities, housing and a multi-use sports complex. One of the first people English presented the GDC’s plan to was Dr. Tim Magner, president of the Greater Shreveport Chamber of Commerce. English said he believes GDC has the support of the parish for a new criminal justice complex within the development. English said that project would include consolidating the District Attorney’s Office, all of the courthouses and parish employees into one facility. Caddo Parish District Attorney James E. Stewart Sr. said he is neutral on the development of Cross Bayou. Another element of GDC’s proposed development is a multi-use sports complex. English said that the Saints officials wanted to know that the political aspects of the project were resolved before they got on board. He said Gov. John Bel Edwards told him he would help any way he could with those negotiations. The GDC thinks the sports complex should move forward even if the Saints do not move their training facility here, English said. He said Shreveport doesn’t have a similar type of facility where Caddo Parish schools could play football and soccer. English said Phase 1 of the project would include 500 residential housing units – 30 percent affordable housing, 30 percent market rate and 30 percent luxury. English said officials with the state have asked what would happen with the existing state office building at Jordan Street and Fairfield Avenue. English said the state recently put $6 million into that building for mechanical repairs. The Cross Bayou Point development would be a public-private partnership, English said. Phase 1 of the development includes a $50 million public investment to assemble the land, environmental cleanup, hard banking Cross Bayou and putting in infrastructure. English said GDC already has spoken to the Red River Waterway Commission about hardbanking the bayou. He said GDC will work with the area’s federal lawmakers to bring the U.S. Army Corps of Engineers on board with the project as well. English said he is confident he can generate the private investment needed to fund the project. Raising the private investment needed will be the more significant challenge, he said. English said the private investment in Phase 1 would be $450 million to build the municipal and state office building, which GDC would lease to the state and parish. When Congress passed Opportunity Zone legislation, it opened a door for projects like GDC’s Cross Bayou development to attract funding from major capital markets, English said. “That was a game changer for us,” he added. The Cross Bayou development falls within an Opportunity Zone. According to the Louisiana Economic Development website, Opportunity Zones are a new community development program established by Congress in the Tax Cuts and Jobs Act of 2017. This new federal capital gains tax incentive program is designed to drive long-term investments to low-income communities. The new law provides a federal tax incentive for investors to re-invest their capital gains into Opportunity Funds, which are specialized vehicles dedicated to investing in designated low-income areas. English said that timing is critical to take advantage of the Opportunity Zone designation. Investments made by the end of December 2019 that are allowed to sit for 10 years will pay no property gains taxes. “Because we had this project well underway before that legislation came into place, we have the potential to be the first project in the country of this size and scale shovel-ready to take advantage of these Opportunity Zones,” he said. English presented the GDC’s plan for Cross Bayou to the Caddo Parish Commission at its March 21 meeting. The Commission passed a resolution authorizing the parish administrator and the Commission to enter non-binding discussions regarding Cross Bayou. In May of 2018, the Shreveport City Council passed a similar resolution that supported then- Mayor Ollie Tyler’s authority to execute a non-binding memorandum of understanding between the city and GDC regarding the development of Cross Bayou Point. English said that once the project does begin, looking at it in the long term will be the key to success. Magner said challenges remain to developing this area of downtown Shreveport. English said he is familiar with previous plans to develop the Cross Bayou area, and he believes GDC has learned from those attempts.